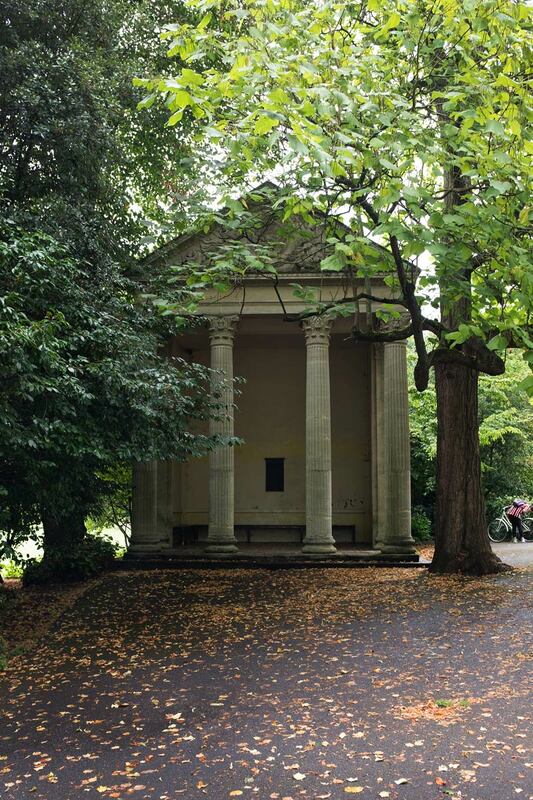 Tucked in a corner of the Sydney Pleasure Gardens behind the Holburne Museum in Bath is this little building. Maybe it is too small to be a folly. More likely it is intentionally of its period to create an ambience in the park that echoes the grandeur of the city. You can see the scale of the building from the cyclist to the right of it. It is a grand little building and in keeping with a grand town that knows just how grand it is. And here is the view looking out onto Sydney Place from the front of the Holburne Museum. This street is echoed in many streets throughout the town. And in the upper town there are grand terraces in the same style. Almost all of the buildings in the centre of Bath are in this pale creamy-buff stone. I am not sure whether it is sandstone or limestone but it has weathered well. We were told that the stone to the west into Somerset is a grey colour and that the stone to the east into Wiltshire is this same warm colour. Although it is in the shade, I think the stone of the little building is greyer than the surrounding buildings. Perhaps it is Somerset stone? The big question is whether grey or creamy-buff, the fact that it is everywhere would start to grate on my nerves? I have lived in places where all the stone is the same colour. In fact Edinburgh is such a city. But it doesn’t oppress me. Bath, on the other hand, is such a tidy little place in a narrow and steep-sided valley that I think after a while it would get to be too much. Here is a crop from the right of the frame of the previous shot. 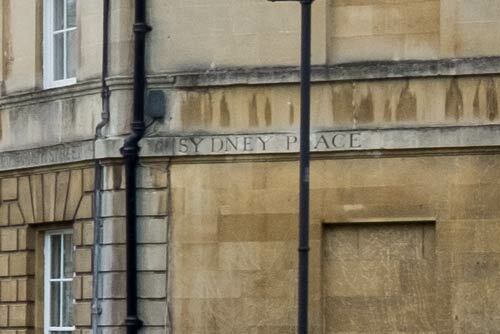 You can see the way the names of the streets are incised into the stonework. 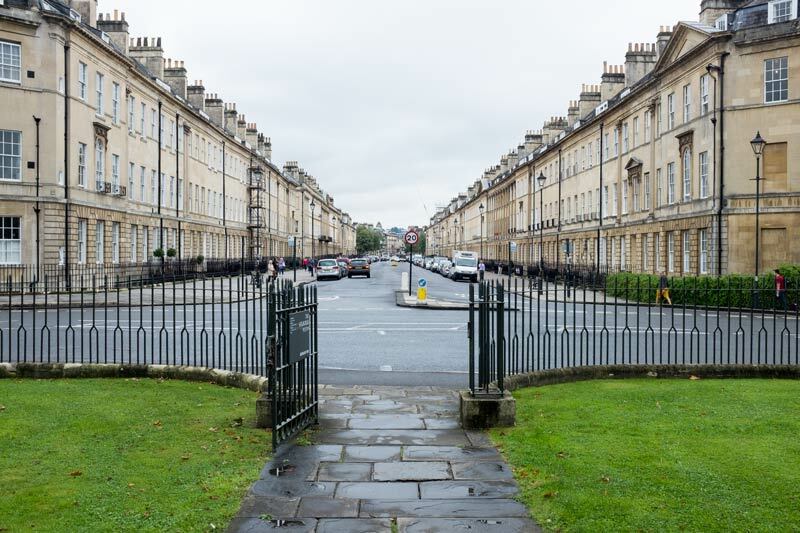 Tamara observed how it was a sign of just how wealthy Bath was when it was being built. I hadn’t thought about brick. I grew up in a city where brick was everywhere, and it just looked solid, friendly. Red brick has always had that feel to me too. That’s partly why I fell so much in love with Saint John. There truly is an awful lot of “same old, same old” here, isn’t there? Too neat, too perfect. But the Folly, on the other hand (is there such a thing as being too small for a Folly? ; ) well, the Folly is delightful! Isn’t a folly by definition a building without any apparent purpose other than that of decoration – or to display the disposable income of its patron? Yes, I think that is right – I was thinking of follies like the faux-Roman thingumajig on Calton Hill here in Edinburgh. You can see it from miles away. Holy now, that thing is MASSIVE! It is the memorial to the Scots who died in the Napoleonic Wars. It was designed in the 1820s and never finished. Officially it is the National Monument of Scotland but it has other less positive names among local people. One of the architects designed the National Museum Of Scotland, also in Edinburgh, and that is a fine building. But I cannot imagine what this monument would have been like had it been finished. 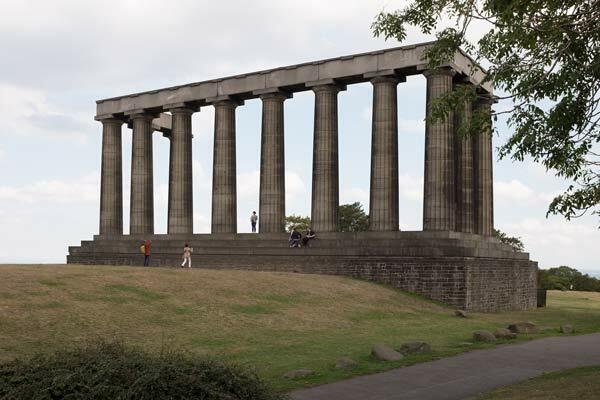 Calton hill is small, cosy – this would have killed the landscape. As a folly it is the lesser blot on the landscape.